Optimizing Website Design. Driving Website Traffic. Maximizing ROI. WELCOME to Digital Lead Source - Minnesota Web, Marketing & Video Promo Specialists! Complete, Professional Web & Print Design Services; logos, brochures, web sites, banners, flash, html, seo & sem, marketing, consulting, training, digital printing and much more! 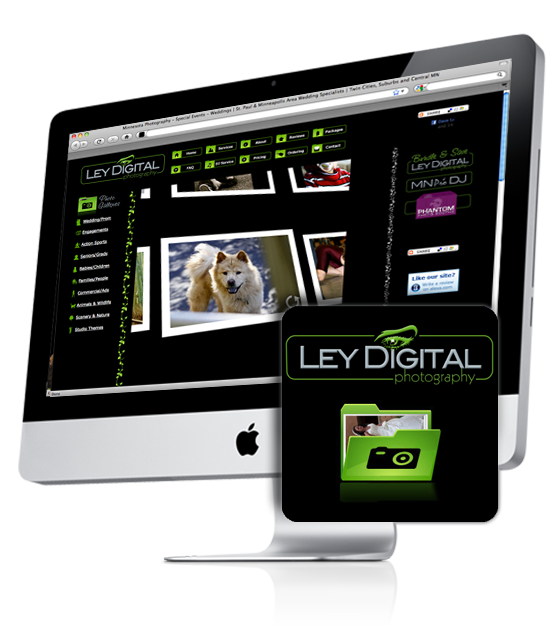 Since 1998 we have been helping clients with their Web Design and graphics needs. We take a unique approach in developing a complete web site that will help you sell in this ever-growing virtual market. We have proven success with many companies and businesses, some of which have tripled business in less than one year! When it comes to web design and web development, there are many options available; from free templates and hosting down to custom Flash and more traditional HTML style sites. Flash web sites are the cool looking interactive, animated ones. These can be a great way to get extra attention online, but what most people don't take into consideration is that most sites built completely in Flash can be hard on your business and make it more difficult for clients to find you online. SEO (search engine optimization) is best implemented through HTML style web sites Another problem is that some Flash web sites are so complex it takes a while for them to load. The average client waits about 8 seconds before moving onto something else if the web page does not load or if they do not find what they are looking for. No one likes to wait for a Flash web site to load, they just leave and find a better source. Implementing Flash with HTML/PHP pages can be an excellent way to achieve the best of both worlds. Just be aware that web design is very complex and there is a lot to consider besides looks. When creating a business website, implementing SEO tactics and always considering marketing will this help clients find you and get their their business. That is our specialty! 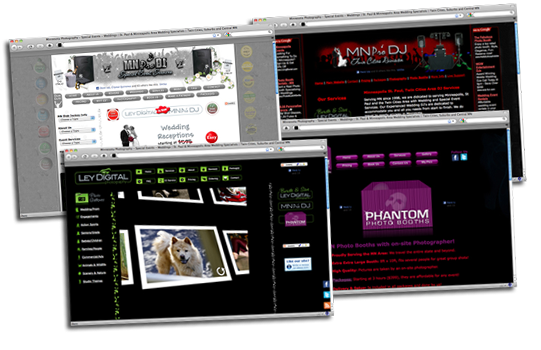 Proper web design & web development is critical to your businesses success. Competition is always high, so you need to make yourself stand out above the competition! 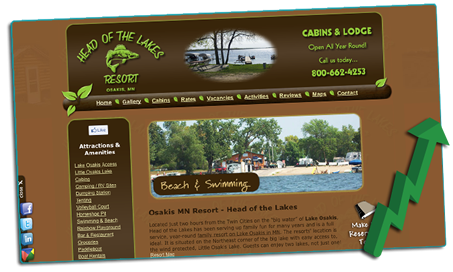 New owners had purchased Head of the Lakes Resort and had a very outdated and incomplete website. They know that they needed a web presence that was appealing to potential clients the second they saw the website and that these potential clients would feel welcomed by the natural feel and atmosphere that their resort offered. Being new owners, they wanted to make sure that they were easy to find for all the major searches potential clients would use to find a resort in their area. Digital Lead Source was able to optimize the entire site and achieve unparalleled success at getting their site to the top of all the major searches for the main keyword phrases Head of the Lakes owners hoped to get and many more! Below is a chart showing some of the major "Keyword/Phrase Searches" that potential customers would most likely enter into a search engine to find Head of the Lakes Resort. It also shows the "Search Result" (which page and the position on that page that www.headofthelakesresort.com appears when performing the related Keyword/Phrase Search). There are dozens more search terms that appear on search results. Head of the Lakes Resort also appears on "google places" for MANY searches. There are a lot of “Web Designers” specializing in web design, a lot of “Web Developers” specializing in web development, and “SEO & SEM Specialists” claiming to drive web traffic, and leads. However, very few offer a complete “WEBMASTER” approach, including end to end, enterprise-grade solutions, to ensure fiscal ROI.